Having spent time touring Europe and the USA, we here at KEA reckon that travellers in Australia and New Zealand have it quite good in terms of security, both personal and property. We tend to take that for granted and it does make us a bit blasé when it comes to locking up, hiding things away and even keeping track of our wallets. We’ve noticed in our travels overseas that ‘obvious’ tourists are often prime targets for theft. Although it would be good for advertising, many rental motorhome companies take the precaution of not having their vehicles readily identifiable at all. In addition, items like small safes are standard fittings in rental vehicles. So what sort of precautions can be taken to ensure that we and our possessions are kept safe? Remembering to lock our campervan and motorhome when leaving it might sound obvious but there are many pleasant camping spots where it’s assumed everyone is honest. If you prefer to leave the key behind, then can we suggest somewhere more original that the top of the tyre or the nearest bin. KEA Tracks was slightly embarrassed some years ago at a CMCA rally when returning to our motorhome, to find two police officers waiting. They were actually there out of personal interest to look through our motorhome but were amused when we retrieved our key from the front tyre. Particularly if camping in remote locations, it’s always a good idea to ensure it’s quite easy to drive straight out of your camping spot in an emergency. That is, not have to back out and manoeuvre around. Along those same lines of thought, reversing cameras are a great safety feature, not only when driving and reversing but also for checking if anyone is hiding behind your motorhome. Lots of motorhomes now have an excellent security screen door as standard which can be left locked, but many windows are low enough to climb in without too much trouble. The pull-down insect screen really doesn’t cut it in terms of keeping out undesirables, and we’re not talking about insects. 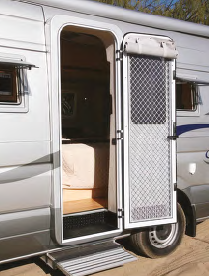 Still on the subject of security doors, does your motorhome have one? We consider them to be a good investment and on pre-loved purchases in particular, it would be helpful to ensure that one can be retrofitted. Some motorhomes have mini safes fitted, mostly for smaller items like wallets, passports and jewellery. There’s much to be said for these but there’s even more to be said for ensuring that all valuables are kept out of sight when a vehicle is parked somewhere unattended. Items like laptops and iPads are always tempting targets but we know it’s often convenient to have those devices charging up when not being used, usually out on a table somewhere. A few enterprising folk we know of have built little ‘charging cupboards’ in their motorhomes for this very reason. Ensure air circulation is not blocked off, however, because batteries heat up when being charged. Personal security and safety is also a consideration too. Many of us like to travel to remote places but there really aren’t too many excuses for not being either contactable or being able to contact someone. Satellite phones are still on the expensive side – but can be rented – however, there are many mobile phones designed for rural/regional use. It’s wise to check with your service provider on this; often as the cheapest rate might have limited coverage. Old CMCA stalwart and a friend of this column, Ray Lawson would not forgive us for failing to mention that an HF radio is excellent for outback use. For extended travel in the bush, an Emergency Position-Indicating Radio Beacon (EPIRB) is also something that should be carried. On the subject of mobile phones – does yours have an ICE (In Case of Emergency) number or two in it? That is a person, identified only as ICE1 or ICE2 who can be contacted in an emergency? Opinion is divided on the effectiveness of this but we reckon it’s better than nothing and should be backed up by contact details in, say, your motorhome glovebox and even your wallet or purse. While security can run to very complex systems (with associated costs) the bottom line is that it pays to be aware of your surroundings and think safety.